Today is a holding pattern for the Penguins and Islanders. Pittsburgh has cancelled their practice and we won’t learn about any lineup adjustments, if any, the coach will be implementing for the upcoming elimination game in Game 4. Nobody would know better than him. He was saved from Edmonton’s brutal environment and deployment and plopped on a team who wanted to be skilled and play fast. He started to play to his potential again. He was brought in to play a certain way. Trevor Daley, while not a great player, was brought in to play a certain way. These players have their flaws, but the management team was willing to rightfully ignore them and try to propel these kinds of players to their strengths. What we see now are people conflating the situations of Schultz and Daley being “saved” by Jim Rutherford and the moves he has made since then. Rutherford got a reputation for going bargain shopping on defense. People assumed because Schultz and Daley had some nice moments that it was automatically going to happen for everyone else. The problem is Ron Hainsey, Matt Hunwick, Jack Johnson, and Erik Gudbranson are nothing like those other two in their skill sets. They don’t complement the forwards at all. None of them can skate or make plays with the puck. Yes, the Penguins won a Stanley Cup with Ron Hainsey on their top pairing. Yes, I still think they were very fortunate to do so. You are seeing right now what easily could have happened in 2017 with that setup. You can add sports to the definition, it fits. I’m not, and have never been, the right person to read if you want the fan-sided approach. It’s boring to me. Finding out why things happen is way more interesting. It is the reason I was focusing on the why in 2017 as much as the results. I noticed the trend the Penguins are currently suffering from while they were in the middle of a successful title defense. It was never lost on me how unpopular those takes were going to be. It isn’t popular to point these things out when the results are amazing. Two years removed from a PDO infused title and people are starting to get upset. What happened to our Penguins? Nothing. This was who they were and the likelihood of success with the 2017 approach isn’t high. To do it just the one time is an amazing feat in overcoming odds. To do it again should have never been expected or planned for. We are starting to see how things can and should look when you bail on the things that made you good. Rutherford gave his coach second-rate supplies and the coach is doing what kids do when you give them a bowl and bunch of ingredients. You just throw them all in at once and hope for the best. It’s a bad mix and it makes little sense. It’s almost like the general manager and coach have never really been on the same page with roster decisions. For all the criticism Ray Shero and Dan Bylsma earned, they were always in tune with what they wanted. Rutherford himself doesn’t appear to even know what page he wants to be on most of the time. This is how he operated in Carolina and it is how he has behaved in Pittsburgh. He will make moves to make moves and sometimes they hit and sometimes they miss. The only difference is in Pittsburgh he was gifted one of the best cores of the salary cap era and for the most part he only has to tend to the fringes. Aside from Phil Kessel most of his top performers in 2018-19 came from the last regime (Crosby, Malkin, Letang, Murray, Guentzel) and one of them (Dumoulin) he even traded to the Penguins. Right now he is screwing up what should be one of the easiest gigs in the league by mangling his mid to low end roster parts. Aging cores need help, even the best. That’s the job of the Penguins GM in 2019. The team will head into 2019-20 with over 12M locked into Jack Johnson, Erik Gudbranson, and Patric Hornqvist who isn’t getting any younger. No speed or puck skills to be had there. There is a fine line. The sport is riddled with variance. Mike Sullivan is right in this regard. What he is completely wrong about is the series had to be a defensive battle. The team put up 70 attempts at 5v5 in Game 1. One of their best performances of the year. On that particular night they were on the wrong end of the thin line. So then why did he panic and make changes to the team and cause the hypothetical line to get thicker? Why did he make choices to make his team worse? Make no mistake that is what happened. The Penguins intentionally lowered their chances of “getting lucky” or “getting a bounce” because they don’t have as many attempts to get those things. In both of Games 2 and 3 they saw 20 less chances or bounces to get lucky on than they did in Game 1. It is a less than ideal strategy when facing a goalie who was .930 on the year. The crazy thing is if the Penguins own who they are and focus on generating and not defense they could potentially still make this a series. They have the players to make it happen. The problem is they burned two needless games while forgetting who and what they are. The fine line Sullivan referenced is looming even larger right now because even games where you do the right thing aren’t always rewarded in this sport. There is no buffer zone anymore. The Penguins can play an awesome game and still be done. You had a third line who was dominating. You can utilize that line to free up the big two for better matchups. Teddy Blueger is one of the Penguins 12 best forwards. He shouldn’t be sitting. Adam Johnson may not be one of the 12 best, but right now they need speed and he has it. Garrett Wilson and Zach Aston-Reese don’t provide it. On defense you can maximize Olli Maatta’s passing skills by placing him with somebody who is great and can move well. Letang will elevate Maatta. That is what the sizable evidence shows. This leaves Brian Dumoulin to help give a life raft to Justin Schultz. The team needs Justin Schultz to push from the back end. It hasn’t happened many times this year and Game 1 was one of the few times, hmmm. They need at least two pairings who can move the puck. Less than two is going to end badly for the Penguins and might end badly anyways now. Aside from the lines a coach starts the game with he can also manipulate TV timeouts and the end of the periods. Sullivan does not do this. 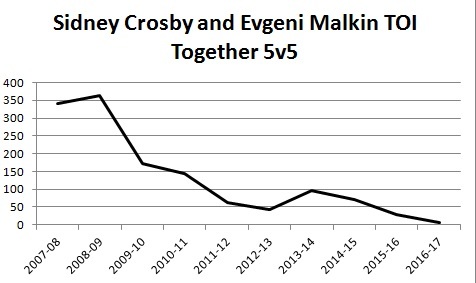 We never see Evgeni Malkin join up with Sidney Crosby coming out of a TV timeout or to finish out a period. For a team struggling for offense I might think about putting the two most statistically dominant players of their era on the ice for a few shifts together. This is just another little thing where the Penguins don’t maximize their best assets and leverage against the opposition. Imagine getting a few shifts a game with the three-headed monster? It isn’t like you can’t follow it up with a Guentzel-Bjugstad-Hornqvist shift. Get creative for crying out loud. This process back needs to start with playing a good Game 4. It’s only step that matters when you are in a 0-3 hole. The easiest way to play a good game is to have a lineup which makes sense. This makes more sense for who the Penguins are and how they can be successful. The alternative is to go back to the current well, get swept, and watch a general manager overreact in the summer while making moves he will never be around to see the consequences of.